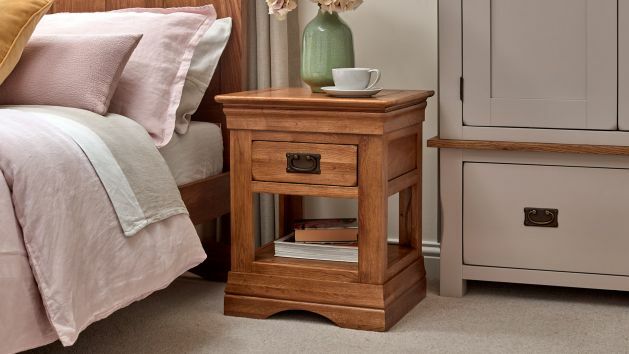 Whatever your style of choice may be, you're guaranteed to find an oak bedside table that will look great in your bedroom for many years to come. Bedside tables are excellent for storing everything from your charging phone to a secret stash of midnight snacks. If storage is what you’re looking for, units with drawers or cupboards are great for hiding all sorts of knick knacks away, or a simple shelved unit provides a minimal look. Our oak bedside tables include ranges like French Farmhouse, inspired by classic French design, or Alto, which favours clean-cut lines and bold right angles. Whatever your style of choice may be, you're guaranteed to find a piece that will look great in your bedroom for many years to come. Browse below our selection of oak bedside tables!